Meet FAR’s Berd Office team: the main officers of FAR’s one-year-old Breaking the Cycle of Poverty Program (BCPP)*. Many team members are named after flowers and other natural elements. Astghik is the little star, Hasmik is Jasmine, Heghine – wicker, Zarine – dawn… and they are all led by Lusine – the moon – Grigoryan. “I will never leave my homeland. I cannot understand those who do,” Lusine says. She is always striving to make the absolute most of BCPP that is working to help the city of Berd and its surrounding villages in the Tavush region. The Berd team’s job is not an easy one. In addition to the many faces of poverty that they battle every day, including bad social and economic conditions, lack of education and resources, malnutrition and health problems, they have to deal with almost-everyday sniper fire from across the nearby Azeri border. 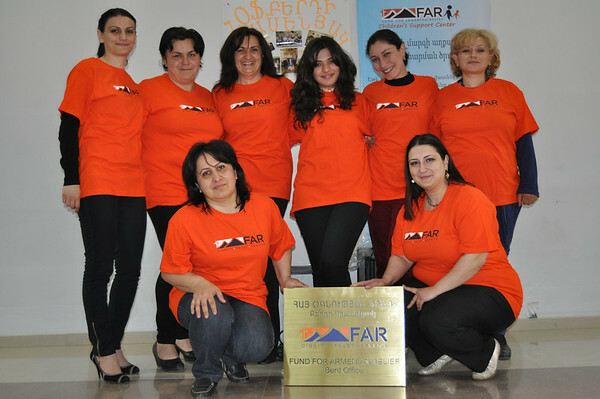 FAR has launched the five-year BCPP to comprehensively address social, economic, health, education and family issues in the Tavush region that are all interconnected. 260 beneficiary families with three and more children have already been selected for the program, economic packages for the beneficiaries have been developed, soon-to-be renovated schoolyards are under construction, and the work persists. “Breaking the Cycle of Poverty, Developing Thriving Communities” was founded by the Mardigian Family Foundation through the largest-ever contribution made to FAR.